Craft is part of the culture of Virginia’s Blue Ridge. From arts and crafts to hand-crafted food & drink, there’s tremendous pride and attention to detail in the things we make. The craft cocktail scene showcases some of the amazing flavors of the region. With September being Virginia Spirits Month, it’s a great time to highlight the best craft cocktails in Virginia’s Blue Ridge. Get a taste of Franklin County’s history as the Moonshine Capital of the World with the craft spirits and cocktails at Franklin County Distilleries (pictured above) in Boones Mill. The tasting room offers the opportunity to sample various spirits or mixed into delicious “concoctions” such as the Apple Pie or Berry Delight. For many, the cocktails at Lucky in Downtown Roanoke are the gold standard of drinks in Virginia’s Blue Ridge. The bartenders are experts in creative flavor combinations and the ingredients & presentation are first-class. It’s why Lucky has had drinks featured in books and numerous publications. Stop in and order “The Cube” and you’ll see what we mean. While Tizzone may have more of a reputation as a wine bar, it’s also a great option for cocktails. With house-made Tito’s infused vodkas, the drink menu has an extensive selection of martinis & hand-crafted mules. You can also build a spirit flight, which consists of three 1 oz. pours from a variety of whiskeys, scotch, and tequila. Begin an amazing dining experience at The Blue Apron Restaurant in Downtown Salem with a cocktail at The Red Rooster Bar. It’s an intimate space with hand-crafted cocktails that feature fresh, seasonal ingredients. You’ll also love the opportunity to pair the drinks with the delicious dishes on the menu that specializes in farm-to-table cuisine. Grabbing a seat and enjoying a drink in the courtyard at Billy’s is the perfect way to spend an evening out in Downtown Roanoke, whether it’s with friends or that special someone. With its location in a building that once served as a brothel and a gathering spot for Roanoke’s thirsty railroad workers in the city’s early days, having a cocktail at Billy’s is a quintessential experience. You can’t go wrong with any of the drinks that feature the bar’s impressive collection of whiskey and bourbon. An outstanding variety of tequila and mezcal serve as the basis for the wonderful margaritas and other assorted cocktails at Tuco’s Taqueria Garaje. It’s the perfect pairing for the authentic tacos and you’ll love the vibe at this hip spot in Downtown Roanoke’s West Station area. For those looking for a little spice, try the Jalapeño Margarita! Twin Creeks Distillery in Henry brings a spotlight to the history of bootleg liquor production in Franklin County and the art of the liquor-making process, which has been part of the Prillaman family history for generations. Now, the Prillaman family operates Twin Creeks Distillery as a way to tell that story and introduce visitors to the whiskey and brandy that helped put Franklin County on the map as the Moonshine Capital. You can choose from a drink list that includes 120 wines, 130 liquors, and 70 martinis, but any local insider familiar with Frankie Rowland’s, Roanoke’s premier steakhouse, will tell you that you have to try the signature Pineapple Martini, which is made from fresh pineapples. Cheers and aloha! Bar manager Shane Lumpp has elevated the beverage program at The River and Rail to the next level with his take on classic cocktails and original creations. Every dish at this award-winning restaurant is expertly crafted to showcase the best ingredients and flavors, and you can expect the same standard with every drink you order. When the founders and owners of Lucky Restaurant elected to open Fortunato, a hip Italian restaurant specializing in authentic Italian dishes and Neapolitan pizza, it was no surprise that the cocktail selection was also on point. However, they made the entire experience even better with the addition of Stellina, an intimate speakeasy located beside Fortunato that specializes in hand-crafted drinks. Stellina has been featured by the New York Post in a piece about some of the world’s best small bars. Whether you opt for a seasonal creation or one of the Local Roots’ favorites, you can’t go wrong with the hand-crafted cocktails at Local Roots. 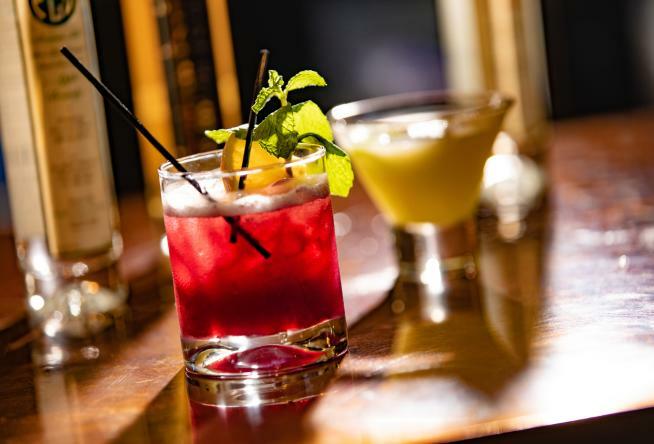 The bartenders at this popular restaurant in Roanoke’s Grandin Village present a great selection of drinks that feature all kinds of infused spirits and fresh ingredients. There are lots of options for enjoying a drink at 202 Social House, such as on the Market Square patio or in the main dining area, but for an added element of cool, check out the speakeasy located in the back of the restaurant that’s open on Friday & Saturday nights. It has its own entrance in the Kirk Avenue alley and there’s not even a secret password required to get in! 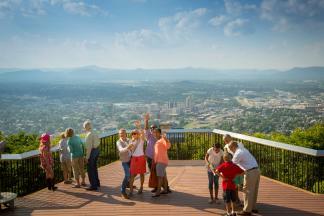 Learn more about the craft beverage scene in the region by checking out Virginia’s Blue Ridge Cheers Trail. 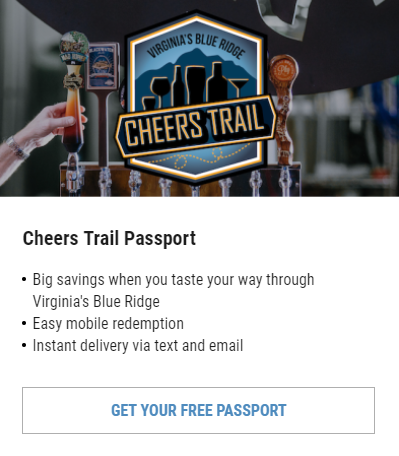 Download our Cheers Trail passport and check in at five participating locations and we’ll send you a free t-shirt! You can also learn more about local spirits by taking part in the Appalachian ‘Shine & Spirits Tour operated by Tour Roanoke.